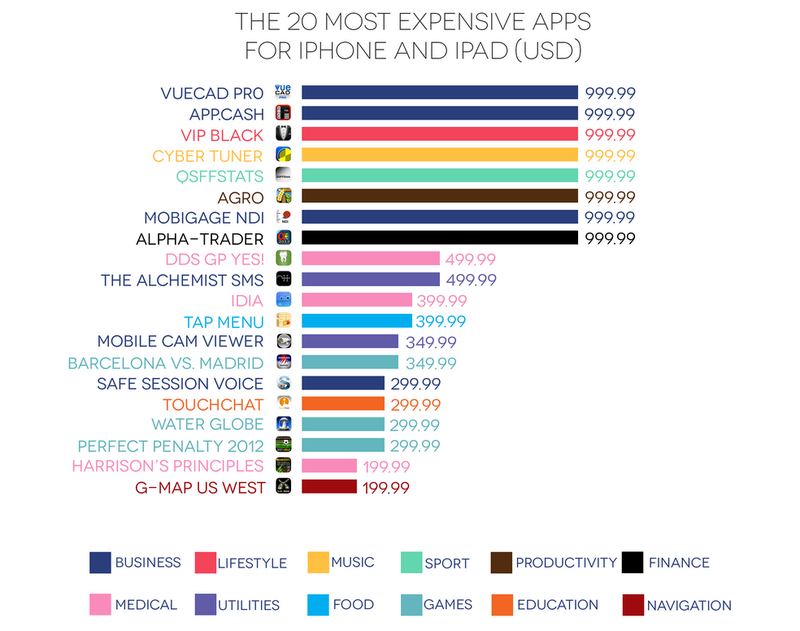 If you thought $10 was highway robbery when it comes to apps, this colorful infographic should help put things in perspective. It's arguable that a few of the apps listed here are worth their eye-popping price tag—Harrison's Principles, for instance, is basically a medical textbook for doctors, while IDIA is the veterinarian's counterpart. But others, like Water Globe, which is literally a $200 set of digital snow globes, will leave you seriously wondering what the human race has come to. And then you've got your reeeally egregious cases like app.Cash, the $1,000 virtual cash register for iPhone. Yes, your money will be safe with this register's app developer, and once you pair it with your 10 thousand dollar Apple Watch, you won't be needing to make any additional deposits for a long time.